We loved!!!!! 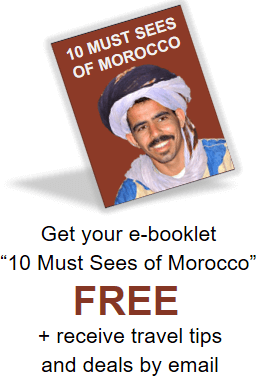 our Moroccan adventure and it just becomes more amazing in our memory as we tell family and friends about it. Everything you had helped us plan for the trip flowed seamlessly. Our driver, Majid, was amazing!! He made us feel totally safe and well-cared for. He was always right on time, always made sure we knew what to expect, and was a wealth of knowledge about the culture, the history, the geography, and the religion of the country. 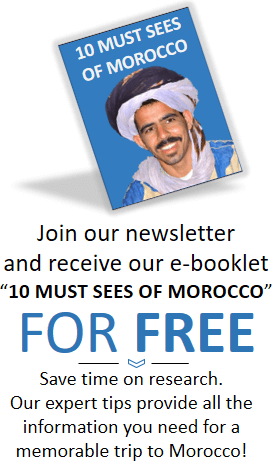 He also arranged some extra and unique cultural experiences to enhance our experience—a private tour of the back streets of Moulay Idris, with a lunch of quince and chicken tagine prepared by a friend there—served in her home; a delicious couscous in his own home, prepared by his wife and shared with his family; a visit to a nomad tent, with tea served, en route to our desert experience; a cave and private home visit in the old city of Ouarzazate; and a private henna session, with tea and brunch in the home of a friend in Marrakech. All very fond memories now! The highlight of the trip for us was our desert experience—everything about it. 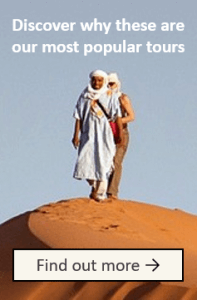 We loved the slow trek on the camels over the sand dunes—just the 2 of us and our camel driver. He stopped to do his prayers along the way—very moving! The camp was much more elegant than we had anticipated =) We were met and given warm moist cloths to freshen our faces and hands and served tea and cookies. Then we were taken to our tent, which was complete with full bathroom facilities, including shower! (We were expecting an outhouse.) The meals we had there in the camp, dinner and breakfast, were the best of our entire trip. Dinner was served outside under the stars! Sunset and sunrise were both spectacular! And we had a campfire after dinner with Berber drum concert. Very magical experience! Most of the places we stayed on our tour were excellent. We were always expected and in most places we were made to feel like special guests being welcomed into their home—complete with welcoming tea service. 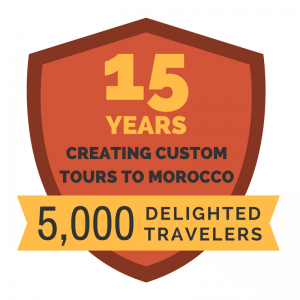 Our favorites were Riad Clos Des Arts in Marrakech and Dar Al Madina Al Kadima in Fes. The rooftop terrace breakfasts in both of these places were just amazing—both the setting and the food options. We also loved Ksar El Kabbaba in Skoura—we could have stayed there for a week—very restful environment. We enjoyed a hammam there =) Our experience was not as positive in 2 of our accommodations. We had some excellent meals and some that were less than what our expectations were for meals on the trip. In general, we did not like eating at the “tour group” venus, which were often where we stopped for our lunches while we were traveling with Majid, or, for example, in Fes, when we had a meal while watching a “belly dancing” show. We weren’t sure if that’s the best that were available, or if Majid thought those would be what we would like. We did not specifically ask for certain restaurants, as we thought he would recommend or bring us to the most authentic Moroccan places. So that was a bit of a disappointment. Our guides in the cities were very good, for the most part, especially the guide in Fes; although the one in Volubilis seemed to be rushing us—we could have spent much more time there. It was a very incredible ruin—on par with much more famous ones in Italy. The only other down-side was the amount of driving time. It was wonderful to see so much of the country, but some of the driving days got very long, and we arrived at our accommodations exhausted at 6 or 7 in the evening, and couldn’t really enjoy the setting and the evening there. I have gone on a lot, but only because we hope this can be of help to future travelers. I am not much for social media, but please feel free to post our comments on your website. We found the reviews there very helpful in making our decision about booking this trip. Thank you for working with us to make this trip a reality!! We are very happy we were able to have this experience!